Welcome to The All Shook Up Band’s Website! Ukulele is a revolutionary art form. 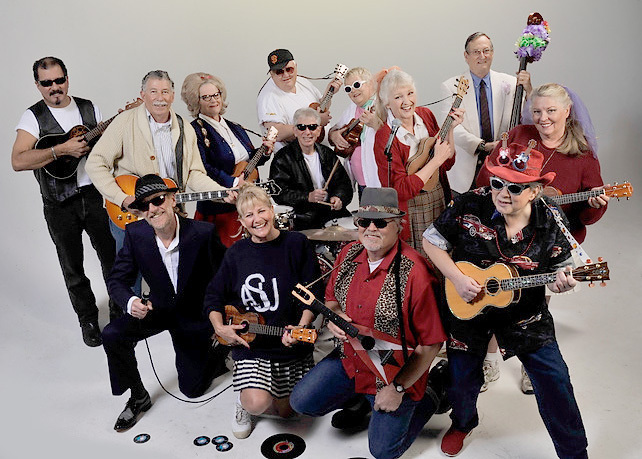 And, perhaps, no other group represents and approaches that statement more fearlessly than the All Shook Up band from Santa Cruz, California. Keeping the fabulous songs of the Fifties alive and vital with a fresh and new perspective using ukuleles, kazoos, and blended vocal arrangements, Carolee Burrows (bandleader), Judy Plicka (lead ukulele), Beth Zimmermann (keyboards & harp), Mickey Tomlinson (bass), Pete Campbell (percussion), Vince Comella (guitar), Bill Coombs, Kathleen Middleton, Cherie Fisher, Rudy Leon, Louise Kioski, Barbara Sonnenshine, and Pat Tracy continue to forge ahead into new territories. A Picnic Afternoon at the Santa Cruz Mountains Art Center in Ben Lomond. You are encouraged to bring a picnic and BYOB. Enjoy homemade Root Beer and ice cream for floats. Bring your uke, snack to share, and Uke Club songbooks. Judy Plicka is Master of Ceremonies. Bill (Coombs) & Babes of the Beach band open the show. Besides bands, there’re surprise guests and songs planned throughout the day by individuals and friends. Pearl and her Hula class are dancing. Los Balladeros are performing. Laura & Clarke are joined by Burning Bacon. Gary & Judy. Three in a Chord sing barbershop and include our friends Bev & Georgene and a trumpet player. All Shook Up are performing short sets throughout the afternoon. Sandor and Friends headline with their British Invasion to end our show. Saturday, June 26th from 3 to 7. 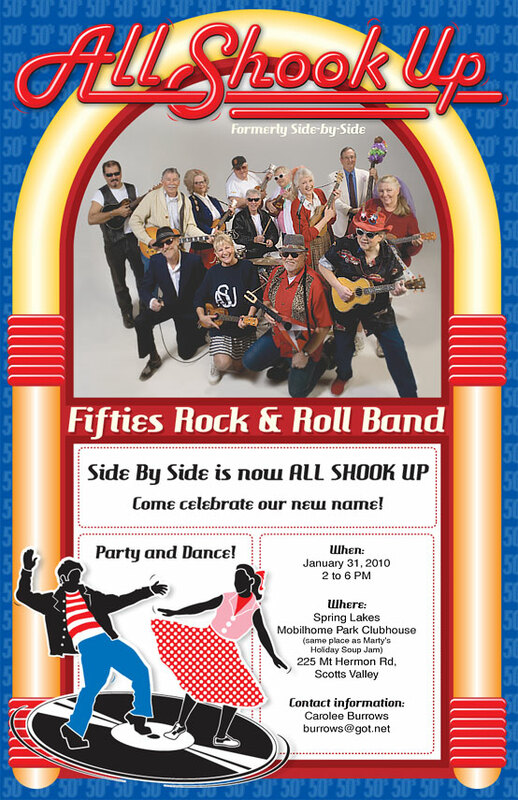 The All Shook Up band is headlining the Ukuleles Gone WiLD! concert at the Art Center in Ben Lomond. This concert’s theme is: Let the Good Times Roll! so bring your ukuleles, your songbooks, some finger food to share, and something to drink. Ukuleles Gone WiLD! Let the Good Times Roll! Live! At the Spring Lakes Mobile Home Park. Come celebrate our new name.